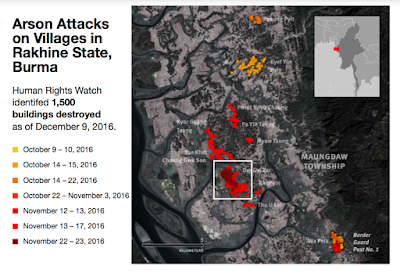 New York – Satellite imagery and interviews with refugees place responsibility for burnings of Rohingya villages in Burma’s Rakhine State squarely with the Burmese military, Human Rights Watch said today. Since October 9, 2016, at least 1,500 buildings have been destroyed, driving thousands of ethnic Rohingya from their homes. Military and government officials should immediately allow humanitarian agencies, the media, and human rights monitors access to all of Rakhine State’s Maungdaw Township. The Burmese government has repeatedly denied using arson as a tactic, instead accusing militants of setting fire to Rohingya villages. The new satellite imagery analysis of villages in Maungdaw Township reveals four new elements. First, the total number of destroyed buildings identified by Human Rights Watch has climbed to 1,500 as of November 23. The full number is probably higher as tree cover may have concealed some destroyed buildings. Second, the pattern of burnings over time suggest government responsibility for the destruction. The first three villages that were burned, between October 9 and 14, are all next to the main Taung Pyo district road, while the villages burned during the second and larger round between November 12 and 15 lie approximately 3 to 5 kilometers west of the road. This progression is consistent with military forces advancing westward rather than militants or local residents haphazardly setting fires. Third, Human Rights Watch documented systematic building destruction in villages on three occasions after government forces reportedly came under attack in the area, suggesting a reprisal element to the arson. In some cases, the fires started hours after a reported attack and in other cases a day or two later. Following an attack on a joint military-border guard patrol in Pwint Hpyu Chaung on the morning of November 12, for example, more than 800 buildings in total were burned in that village and five others nearby over the next four days. 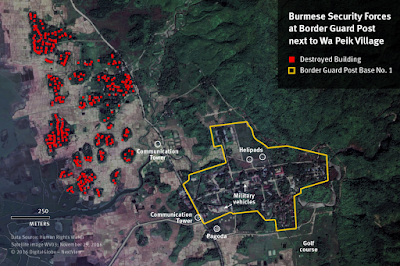 Fourth, the imagery reveals the presence of Burmese security forces in the Border Guard Post Number 1 that is located directly adjacent to Wa Peik village, which was almost entirely burned down in three waves over a one-month period. Militants attacked the post and two other security force facilities on the morning of October 9, killing nine government officers and sparking the last two months of violence. The first fires in Wa Peik started in the early afternoon of October 9, hours after the attack on the border guard base. Human Rights Watch also identified the subsequent presence of multiple military transport vehicles and the periodic landing of military helicopters at the base. Witness accounts from Rohingya refugees in Bangladesh further implicate the Burmese military in arson, Human Rights Watch said. Ten refugees, interviewed in person, described witnessing Burmese soldiers destroying buildings and setting them afire, including in the village tracts of Kyet Yoe Pyin, Dar Gyi Zar, and Yae Khat Chaung Gwa Son. “Abdul,” 23, from Kyet Yoe Pyin village tract, said he fled on October 12 as the military advanced on his village, shooting at residents and setting the village on fire with a combination of gasoline and shoulder-fired rocket launchers. “I saw the army setting fire to the village and aiming and firing at people,” he said. “Chomi,” 35, said he watched the military enter his village in Dar Gyi Zar village tract on November 13, and fire rocket launchers at residents’ homes, causing them to catch fire. He watched from a nearby field as the homes burned and then fled the area with his wife and three children, eventually making it to Bangladesh. “Ahmet,” 45, said soldiers entered his village in the Yae Khat Chaung Gwa Son tract in mid-November and threw jars of gasoline on rooftops, setting them on fire one by one. 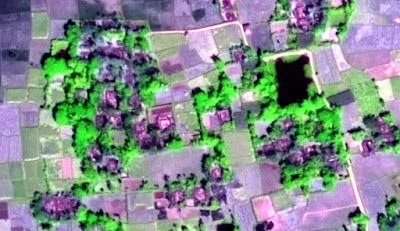 At a press conference on November 16, the Burmese government showed imagery of northern Rakhine State taken from a military helicopter to refute Human Rights Watch’s allegations of village destruction. But the government fundamentally downplayed the extent and severity of fire-related building destruction in the villages of Wa Peik, Kyet Yoe Pyin, Pyaung Pyit, and Dar Gyi Zr, while effectively validating Human Rights Watch’s findings and revealing major building destruction in the villages of Wa Peik and Dar Gyi Zar. The government erroneously claimed that Human Rights Watch had reported the complete destruction of Dar Gyi Zar village. That village was not included in the initial Human Rights Watch report because the damages had not yet occurred. 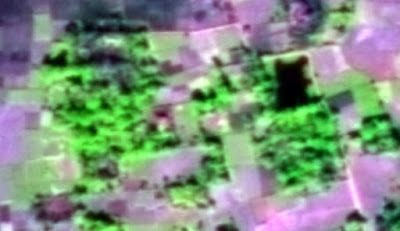 The government said that 30 buildings had been destroyed in Dar Gyi Zar but a subsequent satellite imagery analysis puts this number at more than 250. The government also did not show helicopter imagery of burned buildings in villages near Dar Gyi Zar (including Thu U Lar, Kyee Kan Pyin, Yae Khat Chaung Gwa Son, Myaw Taung, Kyar Guang Taung, Pa Yin Taung, and Pwint Hpyu Chaung) that had been set on fire just before the military helicopter flight. Human Rights Watch subsequently reported the destruction in these villages. 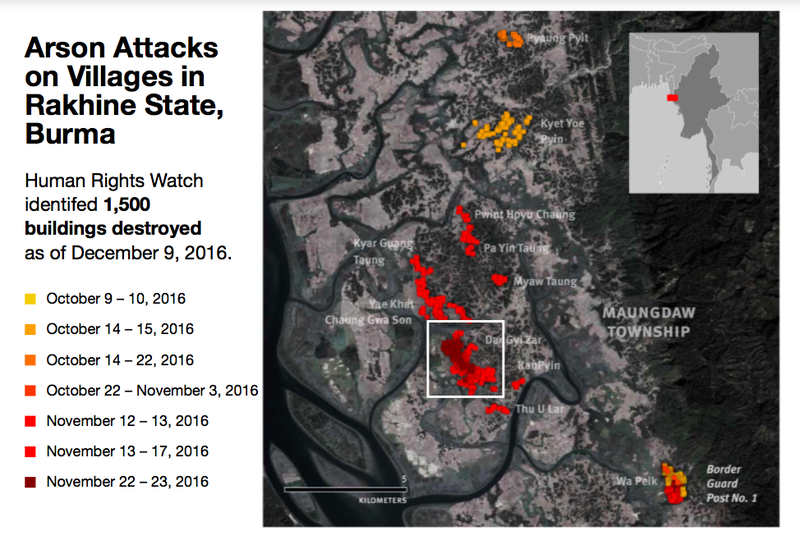 In addition, environmental satellite sensors detected multiple burning fires in the village of Yae Khat Chaung Gwa Son on the early afternoon of November 15. It is likely that smoke from those fires would have been visible from the helicopter as it flew over the area in the afternoon of the same day. The ongoing military operations in Rakhine State since October 9 have had a major impact on the affected population. About 30,000 people have been displaced but the military and government have prevented humanitarian agencies from verifying the numbers or determining these persons’ needs. The International Organization for Migration (IOM) says about 21,000 people have fled to Bangladesh. The government should immediately allow unfettered humanitarian access to all parts of northern Rakhine State, as the United Nations and others have urged, Human Rights Watch said. 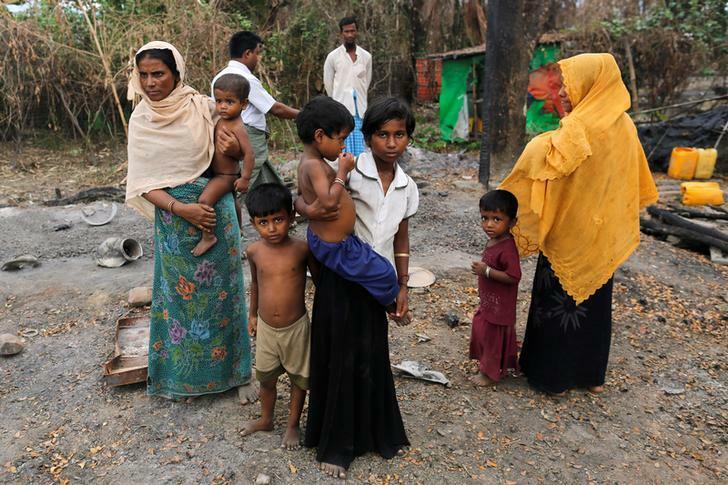 Governments with influence in Burma should press the military and government to urgently grant access. On December 1, the government announced the creation of a committee to investigate the situation in Rakhine State and to report by January 31, 2017. However, the committee’s composition and mandate raise serious doubts that it will conduct a thorough and impartial investigation into alleged abuses, including extrajudicial killings and sexual violence, Human Rights Watch said. In October, the Rakhine State parliament also created a commission to examine the situation, but discriminatory comments against the Rohingya by some commission members have undermined its credibility and objectivity. The commission has thus far failed to seriously investigate alleged abuses by government forces. The government should instead invite the United Nation to assist in an impartial investigation, Human Rights Watch said.